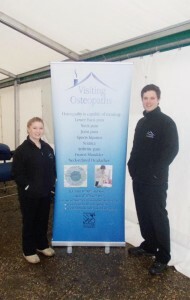 On Sunday 17th March Matt and Keri volunteered their Sunday to help the Reading Half Marathon runners with the pre-run and post-run leg massage whilst raising money for Sue Ryder Nettlebed Hospice. Unfortunately the day started with a deluge as we set up in the charity tent at the Sue Ryder stand next to the MS Society. As the runners started to pour in (pun intended) we took some great photos for the local papers and got to work, stretching and massaging the hamstrings and calf muscles of the runners in preparation for the event. During the 3 hours of massage we talked to our clients about osteopathy and how it might be able to help their back pain, leg pain and other conditions, along with showing them stretches that could help. 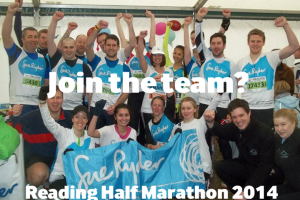 We worked on 20 people, both Sue Ryder runners and regular runners, with suggested donations of £5 to the great cause. However, £100 was nothing compared to what the runners themselved raised so we would have done it for free as long as it meant the runners were able to reach their goal. Thanks to Sue Ryder for asking us to help and look forward to working with you next year.